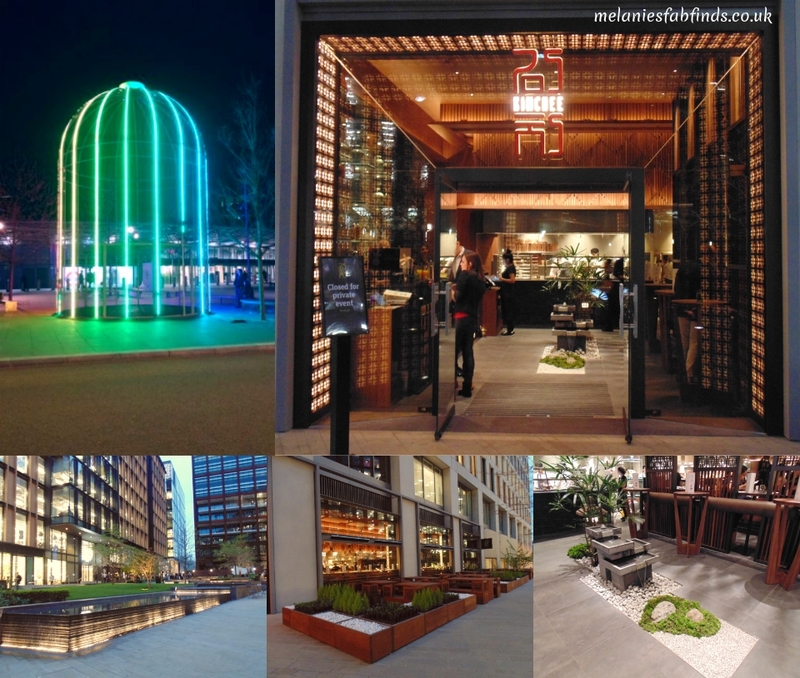 Kimchee have recently opened a branch literally a stone’s throw from King’s Cross and St. Pancras Stations, in Pancras Square, one of the city’s most exciting areas of urban re-development. I’ve not been to King’s Cross often over the years but now I really do have reason to. The area now looks great and there are some lovely looking bars and restaurants. On my wonders around the area I even discovered an observation platform where you could see a few of London’s landmarks including The Shard. If you visit at night be sure to check out the Identified Flying Object (IFO) so named by its artist creator Jacques Rival. This was firmly on the ground when I visited but it did look pretty in with the colourful neon lights which emitting the energy it has accumulated during the day. This first appeared in 2011 and on special occasions may be seen floating in the sky when it is hoisted up by crane. This birdcage like structure not only looks pretty it also contains a swing which the public can use. Kimchee was just around the corner and this Korean restaurant was holding a press evening where I was invited along to sample their food. The entrance was lovely boasting a small yet beautiful zen garden and the bar area was pretty with glass boxes containing vases and bottles of various spirits. Of course when you hear a place has a cocktail menu you simply must try at least one and that we did. The Passion Fruit Frose came with a pretty garnish consisting of an orange slice and viola flowers (edible flowers). The Lychee Love was appropriately garnished with a lychee both of these cocktails were pretty strong alcoholwise and deliciously fruity. I managed my drink but didn’t feel brave enough to get a second and we both drank sparkling water for the rest of the evening. For the location the pricing for the cocktails was good with them starting from £7.50. The kitchen was busy, there must have been between 10 and 15 chefs that evening and the kitchen was open plan so we could watch them at work which I quite like as you can see the cleanliness of a kitchen easily that way too. The starters came out quickly. This dish has the most wonderful sauce which infuses with the ingredients and coats them. The green and red peppers, mooli, rice cakes and mackerel combine well in this dish and we found the rice cakes although unusual in texture quite moreish. The chilli gave it a great kick and the garlic was not overpowering. This has a really interesting mix of textures making eating it that much more exciting. There were a few options for this dish including tiger prawns, tofu, vegetables, shrimp and crab but we opted for the calamari having seen the waiter walk by and serve one to a nearby table. We were not disappointed the calamari was plump, bite sized and tender and the light batter was crisp and had been cooked in fresh oil. The spicy sauce was not to the degree that you would burn your tongue and this portion vanished rather fast! The dish was nicely presented in what appeared to be a giant prawn cracker. We had the chargrilled pork and the chargrilled chicken. These were both full of flavour and came in fluffy steamed buns. Both delicious I’m not sure which was my favourite but I would not think twice about ordering these again. Our waiter Decy insisted we try a side dish. He was well trained and knew about all the dishes having tried them all it appeared. We did take his advise for many of the options we went with and were very pleased that we had. By the time we had gotten as far as this I was feeling kind of full. I know crazy right but having already ordered the main I bravely soldiered on. There was also an option of tofu but the chicken appealed to me more. 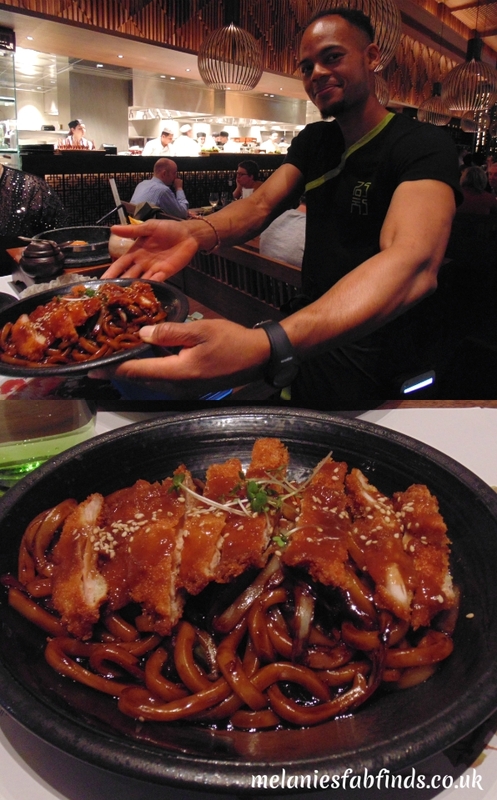 This contained breaded chicken on a bed of udon noodles in a flavourful soy sauce with sesame oil. The udon was very good and the chicken although simple was nice. I was pleased that the sesame wasn’t excessive in the dish. The sauce of this was delicious and really went well with the rest of the dish. Try as I might I had to admit defeat and left some (crys at the thought of wasting good food). There were a mix of options here from beef, eel, tofu chicken and more. The dish is served in a sizzling hot stone pot which contains rice, a mix of vegetables, sesame oil and on the side red chilli paste. This is a great looking dish as you can see and you can adjust the spiciness of it by adding more chilli paste to the heat you require. This enticing dish is a cross between a Chinese fried rice and a biriyani. There is a fair amount of flavour to it too. My friend did a fabulous job of finishing her meal although she did say she didn’t think she would be able to walk to the door after and we did sit a while chatting after we finished the meal. Then it came to dessert. Decy gave us his suggestions and my friend decided for the Baesuk with Ice Cream. This consists of a whole pear spiced with ginger, cinnamon, cloves, peppercorns and honey for sweetness. This is accompanied by an ice cream of your choice so my friend choose almond. The pear was literally as it described on the menu and you could taste all the spices. It was quite hard so wasn’t very easy to cut with a spoon. This unfortunately wasn’t anything to write home about but in contrast the ice cream was amazing. The soft creamy velvety smooth almond ice cream was heavenly and contained pieces of almond. The pair remained with a little missing and the ice cream vanished. I’m sure the plate might have been licked clean if that was an option. I opted for the Sagwa Choux. This is a cream filled choux bun served with an apple puree and butterscotch sauce and topped with a sprinkling of walnuts. Highly recommended by Decy I was confident I was onto a winner. It was very good and I was very pleased with this. I do love desserts and this one works well with its contrast of flavours. We had a really lovely evening. The staff were all very attentive and we didn’t have to wait long for anything. The atmosphere was lively and it really did seem like a great place for people to visit after work for drinks or nights out for drinks with friends in a nice location. The portion sizes are generous so wear expandable clothing and the prices are extremely reasonable for the location. Just to give you an example the udon dish would have been £9.40. Make sure you check the opening times though as I ventured back there on Sunday only to find it was closed, opsy I didn’t realise they don’t open Sundays. My first taste of Korean food was an enjoyable one and I hope to try some more interesting and tasty dishes in the future. Have you tried Korean food yet? No problem, I plan to feature many more London restaurants for you all so there is a great selection of food for all tastes. Kimchee really seems to have been a wonderful experience and all of the food sounds like it was fantastic other than the pear in your friend’s desert dish. Your udon main sounds like something I would really enjoy. This sounds like a great place to have a wonderful meal. It was good and their udon which I believe I freshly made was very good. The food looks incredible and is cooked/presented so well! I am glad you had such a great time! Thanks Candice. I tried to go again on the Sunday but didn’t realise they don’t open then, opsy. This restuarant sounds lovely. The cocktails look really nice, love udan noodles and that pudding with the butterscotch sauce is to die for! It was nice there and those cocktails were delicious!!!! Everything sounds and looks great! I love Asian food. The atmosphere looks awesome too! It had a fun, lively vibe when we went. It’s also great for drinks on a night out. You must. Take some friends and get a selection of dishes so you can all try them it’s more fun that way and you get to sample a good range. Wow, it looks great here. Love the look and sound of the spicy calamari! It was yummy. The calamari was very good, with a crispy non greasy coating and lovely tender calamari. It really is nice I need to experiment and try some more dishes. It is really good. Their sauces are brilliant- full of flavour. Good idea, enjoy your meal. I’ve never tried Korean food before but these dishes look amazing! They were yummy I could eat a few portions of those buns for a meal they were very tasty. I like it when the waiter recommends something and it turns out to be fantastic. Great job to your waiter Decy. Sounds like the restaurant is a must try and the pictures of the food says so! The pictures are a great way to indicate how much care goes into each dish. I do like readers to see what they are gong to get before they go. OMG really. Keep your eyes peeled it’s virtually opposite the google building!!! That sounds a lovely restaurant and you ate a lot of yummy food! Shame about the pear, we love pear desserts. Love the little zen garden and the location sounds fab. The location is great and the other dessert was very nice. I used to work not far from here and never once spotted Kimchee which I am now slightly regretting! This is a recent addition. If you are around at a meal time make sure you pop in. ooh this food looks just my sort of thing. We dine in London a fair bit and are always looking for recommendations. That passion fruit frose sounds just up my street too! It was fantastic the cocktails were very good and not watered down. It was my first time too and I enjoyed it. There is a good mix of options which I liked as they cater for everyone. I’ve never tried Korean food! This looks like a great place! The chicken looks really good, but when I first saw the noodles they were on, I thought it was worms!! Lol, udon are thicker noodles but they taste nice specially with that sauce. 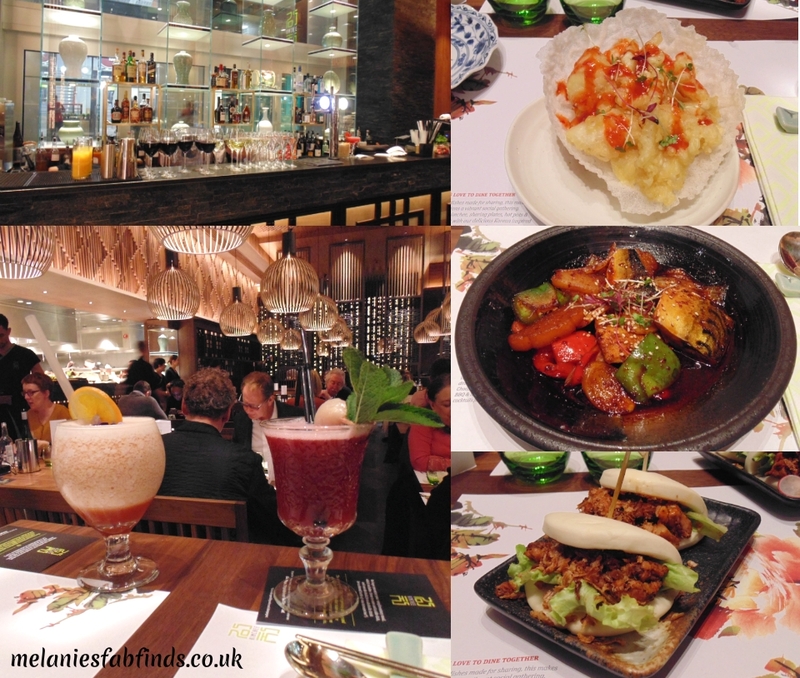 This looks such a beautiful restaurant and love a good bit of fusion food…and a great cocktail too! It is a lovely restaurant and we did enjoy the food. Wow this all looks so yummy! I must pass by sometime. Enjoy Natalie. Make sure you try the buns and the squid!!!! I hope you get to visit I am sure you will enjoy it too. Looks so lovely! I can get a train to Kings Cross easier now so would be great to try there next time I’m down! I hope you get to go it’s such a lovely lively venue and the outdoor seating area is nice on warm days. Sounds a great place to eat though rather to far to travel for us from up North! That’s a shame although if you are in the area you know know where is good to eat. Looks tasty! I need to visit this restaurant. The location sounds good and the food looks delicious. It is a great location and very popular in the week. You will really like the food then. Make sure you try the cocktails too!!! The food there was nice I loved the squid that was well cooked and seasoned and the sauce went well. i’ll remember this next time we’re passing through, would make a change from pizza express! It is a great location and you will enjoy the food too. Love this post I’m so jealous the food looks amazing and your pictures are great! The food was lovely and it does help to see pictures of the type of food and presentation of dishes I think before you go for a meal at a restaurant. I do not even know how I ended up here, but I thought this post was great. I don’t know who you are but certainly you are going to a famous blogger if you are not already 😉 This looks like and amazing restaurant. Cheers! I am really pleased you are enjoying my blog. Me too and this one had a great lively atmosphere. You are definitely spoilt for choice in London and this restaurant looks and sounds amazing. The food looks great, nicely served and by the sounds of it really tasty. I love visiting a new restaurant and the waiters know what they are serving and can advise. It make all the difference to choosing a great meal rather than going with what you already know. It does help when the waiters know about dishes as it helps you discover some great new ones. It was all very yummy and so worth trying. Now you are making me hungry! I can hear my belly talk! I’m a very fussy eater so don’t tend to try much of anything. 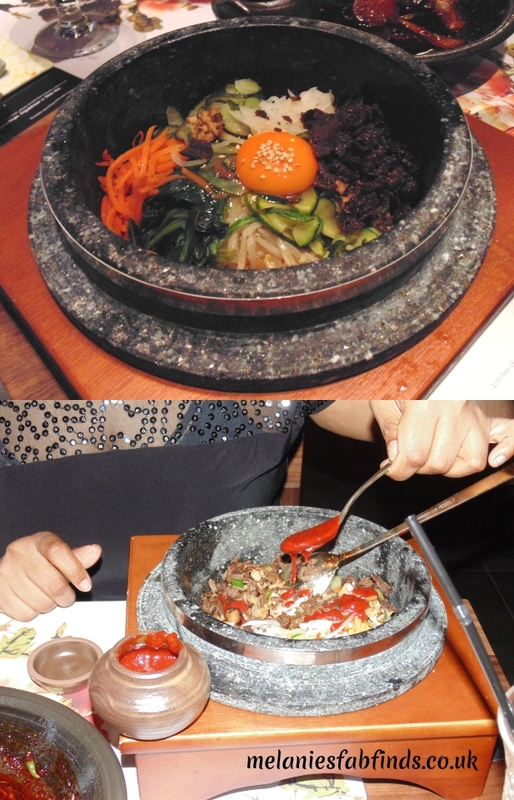 Hubby loves all types of cuisine & tries everything he can, although I don’t think he’s tried Korean food yet. It’s lovely I am sure he will enjoy that too. Oh my gosh, I LOVE Korea food! Bibimbap is my absolute fav but I never finish. It is tasty isn’t it. I need to go back for more. I wouldn’t have known what to choose, so it’s great that Decy gave you some advice on which dishes and sides to go for. I’m often in London and St Pancras is one of the areas where my friends and I meet so I might give the restaurant a go next time we have a girls’ night out! Enjoy the food Mel it really is yummy and make sure you try the cocktails!!! This restaurant sounds, right up my street. I love Kimchee, especially in dumplings, which I kind of have an obsession for. So glad that your wait knew what to suggest, as sometimes when dining out, and you are asking your waiter or waitress for an opinion, some just do not have a clue! It can help when waiters have tried the dish especially if some of them are new to you.